There is a new songstress in town and her name goes by the name of Chris. 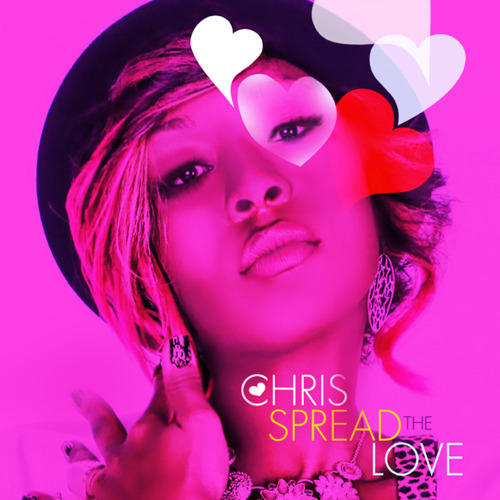 She released an EP yesterday "Spread The Love" and it's packed with heat!!! The tracks are blazing with hot tunes like Yea Ok & Swag It Up Definitely club banggers and Ask Me a soft & sweet ballad. Check it out and download now! Click Album Cover & Download Now! Born Lindsey Christian, Chris is a name familiar to the soul of this singer/songwriter who was born and raised in Washington, D.C. Forgoing a strictly artistic path, she gravitated towards academics at a young age, and after graduating from the Duke Ellington School of the Arts high school, where she concentrated in writing, she went on to double major in Business and Engineering at MIT. “A lot of people ask me about MIT and ‘what that was,’ as they put it. And really I just wanted to major in business at the undergraduate level because I knew those skills would be useful in any career, and I felt that was the best program for me. Engineering just developed into a second major because I was really beginning to get into technology at that time and I knew I wanted to learn more.” After graduating from college, she returned to D.C. where she and her sister began Soblu Inc. Originally started as a film production company tasked with promoting the life and art of D.C., in late 2008 the duo released their debut film, Jazz in the Diamond District, which Chris co-wrote, produced and directed. By 2009, Soblu had developed into one of D.C’s premiere entertainment companies – adding to their arsenal a blossoming record label, Soblu Music Group, and talent management company, Soblu Entertainment. Follow her @chrisworldmusic & visit her site at www.chrisworldmusic.